Something new at this meeting was the use of a professional “captionist” who transcribed the discussions from the board meeting, the annual business meeting, and other plenary sessions. I have been a captionist for Communication Services for the Deaf and Hard of Hearing in Greensboro, North Carolina since 1992. Captioning services provide accessible communication for persons who are hard of hearing and who do not use sign language. Captioning provides real-time written text in any setting and can be projected onto a small screen for one person or through an LCD projector for a large audience. Services can be provided on-site or remotely via the internet. Communication Access Realtime Translation (CART) and Computer Assisted Notetaking (CAN) are two of the captioning services provided by CSDHH. Some of you may remember that we attempted to do similar “note taking” at the fall meeting in 2006, but we quickly learned that there are special skills involved. You may also know that this effort was prompted by Marty Folsom, the past editor of the Tar Heel News. She encouraged us to explore this option, not just for her benefit (she is deaf), but to help others in the audience follow the discussions. Her advice was right on target. Even those with no hearing problems at all found it very helpful to have the written transcript as our rapid-paced, wide-ranging discussions covered many topics in a short period. We’ll be looking at budgeting for this service for large events in the future — come join us at the summer and fall meetings so that they, too, can be considered “large”! 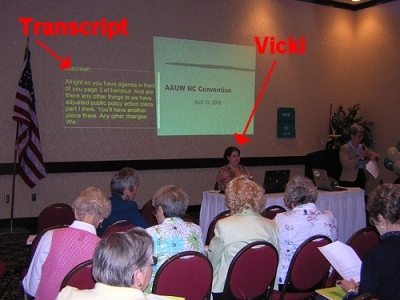 Vicki did send her raw transcript files to us. If you have a need to see what was said, please contact info@aauwnc.org.